One of the steps needed to achieve sustainable bioenergy is to reduce our reliance on synthetic nitrogen (N). Despite the fact that legume cover crops have the potential to increase soil quality and sugarcane (Saccharum spp.) yield, much information is still needed to determine amount of N available from cover crops to sequential ratoon cycles. This study was designed to assess the impacts of sunn hemp (Crotalaria spectabilis) cover crop on soil N dynamics and sugarcane ratoon response to N fertilization during two harvest seasons across three contrasting soil and climatic conditions in southern Brazil. The treatments consisted of cover crop and fallow established prior to sugarcane replanting; in addition to three N-fertilizer rates 60, 120 and 180 kg N ha−1 and a 0-N control applied during the first and second ratoons. Although there was increased sugarcane yield (8–13 Mg ha−1 in first ratoon and 10–16 Mg ha−1 in second ratoon) in plots planted with cover crop, it was not possible to detect significant increases in soil inorganic N, microbial biomass C and Illinois Soil N Test content under cover crop compared with fallow. Cover crop with sunn hemp increased the accumulated two-year yields by 14–25 Mg ha−1 at all sites and NUE (Mg stalks kg−1 N) across all N rates at two sites. 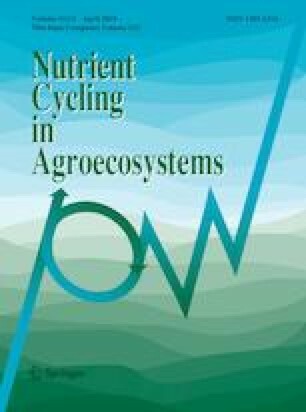 Our findings support the conclusion that cover crop did not change the N requirement of succeeding ratoon crops but increases the yield, thereby improving NUE in sugarcane systems. Crotalaria spectabilis Biological N fixation Illinois soil nitrogen test Inorganic N Cover crop Saccharum spp. The online version of this article ( https://doi.org/10.1007/s10705-019-09979-y) contains supplementary material, which is available to authorized users. This project was funded by Fundação de Amparo à Pesquisa do Estado de São Paulo (FAPESP Process 2014/05591-0). R. Otto received a research productivity fellowship from the Brazilian National Council for Scientific and Technological Development (CNPq) (grant #308007/2016-6). To the sugarcane units Usina Quata, Usina Cerradinho and Usina Boa Vista for providing fields and operation support.